Here are some screenshots from the current version. Is anyone interested in yet another Paperless Caching tool? There are a lot out there, but I thought I’d try my hand at a web-based paperless geocaching application that did the things I wanted it to do and worked how I wanted. 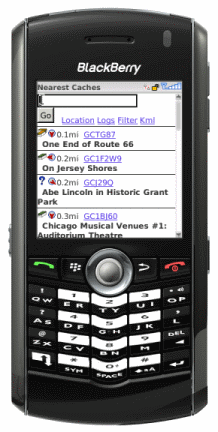 We’ve been using it almost exclusively on a Blackberry 8130 since May 2008 and it is evolving as we continue to use it and think of new features we would like it to have. I’d like to see a few others start using it soon and get some feedback on how it works and see how the application performs with multiple users. I’m also curious about other cacher’s opinions for more features to make it better. The idea is to allow smart phones with unlimited data plans to access geocaching data via the phone’s browser. It is relatively easy to use (I think) and gets things done with as few clicks as possible, and does not require the use of any separate programs to manage or organize data. Web-based, allowing the server to do all the heavy lifting. Phone does not have to be very powerful, but must have Internet data access. – Downside to this is that Internet data access is always required. Loss of data connectivity results in a non-functioning application from the client’s perspective. Relatively small, compressed pages (if compression is supported by the phone’s browser) in order to keep bandwidth usage low. Even so, an unlimited data plan is recommended since every interaction requires data communication with the server. – Typical list of Nearest 20 caches requires about 7 KB of bandwidth on first request (compressed) – including images. With caching of the static images and style sheet, additional requests on the Nearest Caches page drops to about 1.5 KB (compressed) with the uncompressed page size around 5.5 KB. – Typical Details page varies depending on size of cache owner’s description, but are usually around 3KB (compressed). Target clients are any relatively modern smart phone with an Internet mobile browser and a data plan. So far testing has only been done with a Blackberry Pearl 8130 and to a more limited extent on an OpenWave simulator. Easy to use Pocket Query management for uploads, using a desktop browser. All times are stored in GMT. Local time zone can be set on user profile page. Default view is limited to the nearest unfound caches based on the current location (currently to a max of 15 miles away). Aware of location without needing a GPS. Set current location by street address, city/state, zip code, or coordinates. Location lookups provided by Google – any location you can look up in Google Maps can also be used here. 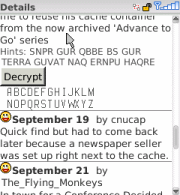 As you post notes on caches (found or otherwise), the current location is updated based on that cache’s location. Search for specific caches that are further away by GC# (with or without the GC prefix) or by partial cache name. Filter allows for more advanced searches and selection criteria; by cache type, difficulty and terrain rating, container type, and more. Cache Details page contains full description (in html) with all available logs based on imported GPX files – this still may not be all logs, but iterative GPX file uploads over time will increase the amount of log data available. If full description is too long, it is converted to plain text and truncated on the main details page. A link is then provided to the full HTML description. List most recent log icons at the top of the details page indicating finds, dnfs, owner maintenance, etc. 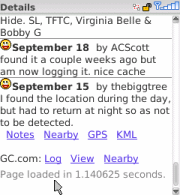 Full logs are listed below the cache description. Link for KML version of currently displayed cache. Clicking the link will automatically launch Google Maps for Mobile if installed with the cache information summary. Links to Geocaching.com cache pages for quick access to the latest and complete information on a cache page – print version in order to keep pages as small and noise-free as possible. Field Notes can be entered, edited, or deleted on any cache including log type (Found it, Didn’t Find it, etc.) along with a short description. 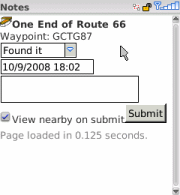 Field notes can be easily exported and uploaded to Geocaching.com Field Notes using a desktop browser. All cache data comes from Geocaching.com Pocket Queries. Caches you’ve uploaded are available to you for about a month since they were last updated with a pocket query. It is therefore necessary to upload pocket queries on a regular basis. This ensures that the data remains “fresh”. Archived caches will “fall off the radar” since they won’t be updated. Caches that you’ve found or written field notes on will always remain available for reference. 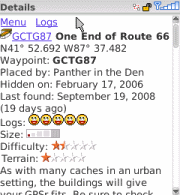 In order to use the site, you must upload a new Geocaching.com “My Finds” pocket query at least once a month. If you have any thoughts on the topic or would be interested in field testing in the future, please let me know in the comments section. I don’t intend to release the application for installation on other web servers but plan to open up the application for other cachers once I have a license agreement set up with Groundspeak. I’ve set up forums to discuss the application at http://www.bcaching.com/forums. If you’re interested in field testing the application, please register there.